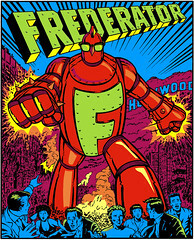 The Frederator Studios Blog: Five nominations for Frederator & Nickelodeon. Frederator Studios is having another great year with the Annie Awards, the Oscars of the animation industry, presented every year by the International Animated Film Society, ASIFA-Hollywood. All five of our nominations are below (marked with ***), including Best Animated Television Production for My Life As A Teenage Robot. Congratulations everyone, you're the best in the business! *** Ben Balistreri - The Fairly OddParents "Crash Nebula"
Shakeh Haghnazarian - "Hi Hi Puffy Ami Yumi"
Patrick Mat'e - "Father of the Pride"
Chris Reccardi - Powerpuff Girls - "West in Pieces"
*** Alex Kirwan, - "My Life As A Teenage Robot"
Richard Daskas, - Samurai Jack "Season of Death"
Michael Giaimo - Hi Hi Puffy Ami Yumi "Episode 1"
John Over - "Jakers! The Adventures of Piggley Winks"
Mark Whiting - "Duck Dodgers"
*** Candi Milo - Voice of Mrs. Wakeman "My Life As A Teenage Robot"
Maile Flanagan - Voice of Piggley "Jakers! The Adventures of Piggley Winks"
Russi Taylor - Voice of Ferny "Jakers! The Adventures of Piggley Winks"
*** Butch Hartman & Steve Marmel - The FairlyOddParents "Channel Chasers"
Etan Cohen, - King of the Hill "Ceci N'est Pas Line"
Lauren Faust, - Foster's Home for Imaginary Friends "World Wide Wabbit"
Brandon Sawyer - Disney's Brandy and Mr. Whiskers "Cyranosaurus Rex"
Click here for the all the nominees and the official press release from the Annie Awards and ASIFA-Hollywood.